A Sheffield man was arrested after a woman was racially abused on a train platform. British Transport Police said the incident happened at Leicester train station around 7pm on Wednesday, January 31. The force said a woman was waiting for a train on platform 2 and was subjected to racial abuse by a man. BTP said a member of the public who witnessed the incident intervened and took the woman to the side as the offender boarded the 7.01pm train to Sheffield. 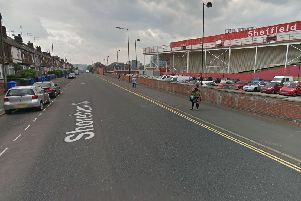 A 60-year-old man from Sheffield was later arrested in connection with the incident on suspicion of racially aggravated assault and has since been released under investigation. Officers would like to speak to anyone who witnessed the incident. A British Transport Police spokesman said: "The man has grey hair and was wearing a white shirt and a purple tie. He wore a long light brown coat with dark trousers and shoes. The man was also seen to be carrying a rolled up piece of paper at the time of the incident. Anyone with information is asked to call BTP on 0800 40 50 40 or text 6101, quoting reference 294 of January 31.